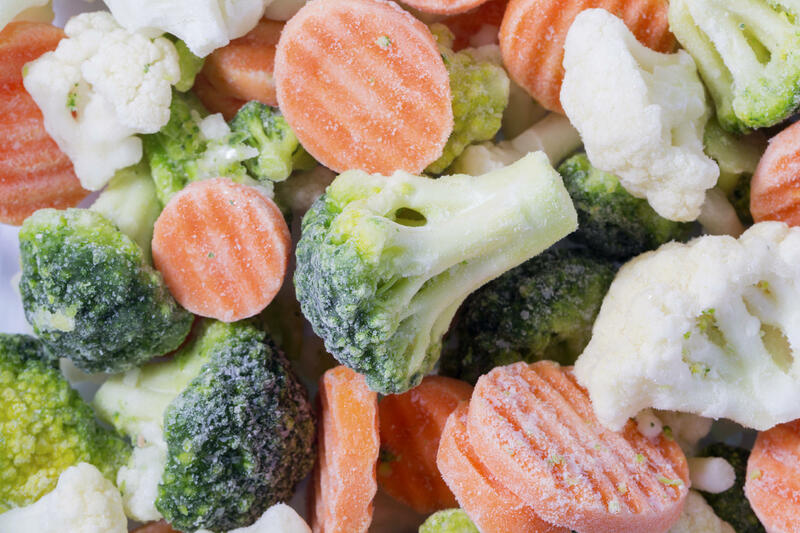 The CDC has announced an outbreak of deadly Listeria monocytogenes bacteria --- and frozen vegetables and fruits are believed to be the cause. Shelves are bare and signs are posted where Blue Bell products were displayed in a grocery store in April 2015 in Overland Park, Kan. Blue Bell Creameries recalled all of its ice cream products following a listeria outbreak. Frozen vegetables are a staple in many diets, so a huge recall of them has us peering at the packages in our freezers. 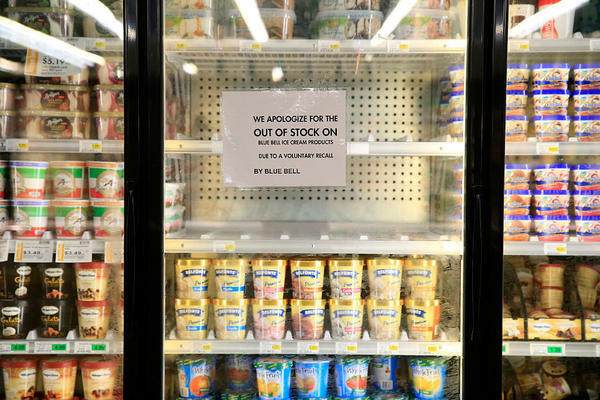 On Tuesday evening, the U.S. Centers for Disease Control and Prevention announced an outbreak of the deadly Listeria monocytogenes bacteria — and frozen vegetables and fruits are believed to be the cause. More than 350 products like green beans, broccoli, peas and blueberries sold under 42 brands at grocers including Safeway, Costco and Trader Joe's in the U.S. and Canada have now been recalled. Although much less common than other foodborne pathogens like salmonella or E. coli, listeria is the most lethal. Most healthy immune systems can keep an infection at bay, but if the bug makes it into the bloodstream, it causes listeriosis and kills 1 in 5 victims. Older adults, pregnant women, newborns and those with weakened immune systems are at higher risk of infection. People 65 and older are four times more likely to get sick from listeria than the general population, and pregnant women — who may not develop listeriosis themselves but whose babies could be threatened — are 10 times more likely. So far, the CDC knows of eight people who have been sickened — six in California and one each in Washington and Maryland. The Washington and Maryland patients died, but listeria was not considered the ultimate cause of death. The patients were between 56 and 86 years old. New tracking tools led to this recall. The outbreak making headlines today began in 2013 with one illness, followed by five more in 2015 and two in 2016. It may seem as if this outbreak is unfolding in slow motion, but that is because the CDC has a new tool to track the bacteria's spread: the sequenced genome of listeria. While investigating a small cluster of 2016 illnesses, the CDC searched its database of previously sequenced listeria genomes and found matches from bacteria that had sickened people in previous years. The CDC's venture into whole-genome sequencing has allowed the agency to identify more listeria outbreaks, especially more that span longer periods of time. Last year, the CDC announced two outbreaks that began in 2010. Listeria gets around — and stays around. The CDC said that frozen vegetables produced by CRF Frozen Foods in Pasco, Wash., are the "likely source" of the illnesses. Michael Doyle, professor of food microbiology at the University of Georgia and director of the school's Center for Food Safety, says he thinks that "resident" listeria caused the outbreak. Rather than "transient" bacteria that contaminate a food and move through a processing system with it, resident bacteria establish themselves somewhere in the processing plant and persist over several years. "The organism is quite hardy," he says. Listeria has been known to plague ready-to-eat deli meats and soft cheeses made with unpasteurized milk, but it's popped up in surprising foods in recent years. Last year, Blue Bell Creameries recalled all of its ice cream products after 10 people were sickened with listeria. One reason listeria differs from other pathogens is that it can grow in cold temperatures. In 2014, 35 people were sickened by caramel apples and officials determined that listeriosis contributed to at least three of the seven deaths reported. And cantaloupe was behind the largest listeria outbreak in U.S. history, which sickened 147 people in 2011 and killed 33. It's time for a freezer check. CRF has recalled all organic and traditionally grown frozen vegetable and fruit products processed at its Pasco facility since May 2014, and it suspended operations there last week. Check the UPC codes and "best by" dates on the vegetable packages in your freezer against the FDA's list. If they match, you can return the recalled food to the store for a refund or simply discard it. Either way, don't eat the recalled foods. Listeria can be killed with proper cooking, but unless you're going to use a thermometer to make sure the foods reach 165 degrees F, it's best not to risk it. If you did eat them and have symptoms such as fever, stiff neck, confusion, loss of balance and convulsions, seek medical care. Sometimes listeriosis symptoms develop up to two months after eating contaminated food, but they usually start within several days.